Get more Subscribers with content you already have! One of the best ways to grow your email list is with a content upgrade. ConvertKit users, like Katie at Wellness Mama, have used this strategy to exponentially grow their list, and it's really easy to do! Start by making it simple. Go into Google Analytics, and find the post with the most traffic. Copy that URL. Done. That’s your first content upgrade! It’s a fair question, but the truth is that people are not diligently searching through your archives for the best posts. You need to guide them there! A popular post has already done the heavy lifting for you by proving its worth. Allow it to continue doing so. The next level is to create a complimentary bonus to that popular post! This could be a checklist, a resource guide, a chapter of your book, or bonus audio content from an interview. Let's get that set up. Choose the Form option in ConvertKit and write your headline. To keep it simple, use the headline of your popular post as the attention-grabber for the Form. Remember, allow the content that has already proven itself valuable to do the hard work. Now, go to the Settings tab to deliver the upgrade. If you are using the popular post method, click “Redirect to another page” upon subscription, and paste the url in so the reader immediately goes to the post. Another option is to click the Incentive Email tab, and if you’re giving away a PDF download (or other file), upload that file to the Incentive Email! By default, your Form will be set to double opt-in, which lowers the barrier to entry for new Subscribers. However, Subscribers who click to confirm, and receive their incentive, are far more successful at staying with you for the long haul! After checking the option to send an incentive email, you can edit the email by selecting Edit Email Contents. NOTE: Clicking the X at the top right will both save the contents and close the editor. You can also check the box to ✅ Auto-confirm new Subscribers. This option will still send the Incentive Email so Subscribers can download their incentive, but it will no longer require that they click the button to confirm their subscription. 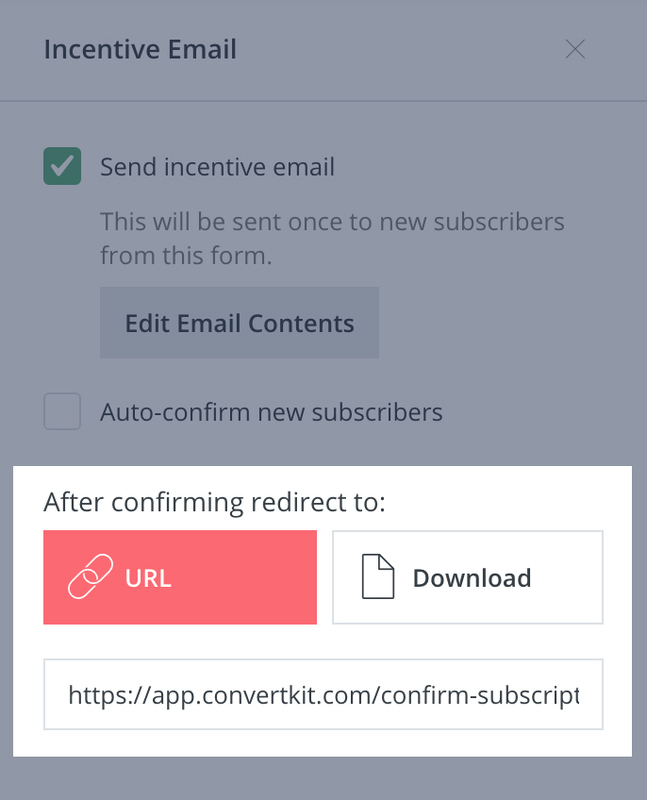 Be sure to set where the the button in the Incentive Email will send Subscribers, whether they will get sent to a specific URL, or they'll get an uploaded file to download. In the Styles menu, you’ll see the current Form template you’re using, as well as an option to change it. NOTE: These options will change as you click on different parts of your Form, such as the fields, subscribe button, and even the “Powered by ConvertKit link”. To return to the main style settings of your Form, click the magic wand again at any time. You can learn more about styling your Form here. You’ll place the Form on your site the same as any other. The only exception is the modal popup referenced above, just follow the instructions. You can paste the JS code, raw HTML, or use the Wordpress plugin option. NOTE FOR LEADPAGE USERS: If you are already using the Lead Magnet delivery options they provide, you do not need to replicate that option in ConvertKit. Just follow our standard LeadPages integration tips to make sure the Subscribers are sent to the right place!